While docked at the Port of Hamburg, explore the best Hamburg has to offer on this hop-on hop-off bus tour. Visit many of Hamburg’s top attractions like the Reeperbahn, HafenCity, and St. Michael's Church, to name a few. Select a 1-day pass, then board at any of the stops and get to know the city in custom fashion, with live on-board commentary in English and German. Includes a sightseeing cruise on the River Elbe. The most convenient and comprehensive way to see the city while you’re in port! Get to know the city of Hamburg and its top attractions in a convenient and economical fashion on this entertaining and educational hop-on hop-off tour. It all begins with a hop-on, of course, at St. Pauli Piers or any of the stops. Board one of the red, open-top, double-decker buses and enjoy the view with live and pre-recorded commentary of interesting facts and stories from an expert guide who knows the city inside and out. Learn about the history and happenings of Hamburg, the economic center of Germany and its second largest city, as the bus rolls along from one location to the next. Hop-off at any of the attractions for a closer look, then hop back on when it’s convenient. Visit popular sites like the Reeperbahn, a street in Hamburg's St. Pauli district that is one of the two centers of Hamburg's nightlife and also the city's red-light district. Also, see HafenCity, Europe's largest inner-city urban development project; St. Michael's Church, one of Hamburg's five main Lutheran churches and the most famous church in the city and much more. The tour features 27 stops in all. A sightseeing cruise on the River Elbe is also included in your package. Enjoy all the architectural highlights of Hamburg from this waterfront perspective. Depart from St. Pauli Piers, then cruise along through Hamburg's impressive container ship terminals and the picturesque warehouse district, into the heart of town and HafenCity. 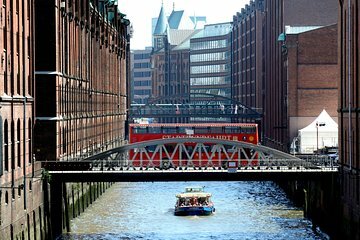 A sightseeing tour of Hamburg has never been easier—or more fun—than this hop-on hop-off bus tour of the city. Experience Hamburg in this unique way. This excursion is located a short walk from St. Pauli Piers, so you determine the time you return to your ship in Hamburg. Please allow yourself ample time to enjoy the excursion and ensure your timely return to the port. This excursion is not covered by our worry-free policy. THE BOAT RIDE WAS RIDICULOUS. WHY WOULD I GO TO HAMBURG TO SEE ALL THE CONTAINERSHIPS IN THEIR PORT. WHAT A WASTE OF TIME AND MONEY. THE BUS RIDE WAS FINE. MY WIFE CALLED IN ADVANCE TO GET DETAILED INFO WHERE TO PICK UP OUR TOURS. THE INFORMATION WAS NOT ONLY WRONG, IT TOOK US A LOT OF TIME TO FIGURE OUT WHERE TO BE, WHICH WE ACCIDENTALLY FOUND. The HOHO tour and Harbour tour were excellent! There are many different HOHO bus companies and we were not provided clear instructions so that we could find the correct bus. We had to show our paperwork to several different companies, many of witch had no idea what we were looking for. We eventually found the right bus. It was also difficult to find the correct boat to do our Harbour tour. At first when we boarded the bus the guide asked if there was anyone who spoke English. He was on the top of the bus and we were on the bottom. Despite our yelling that we did, he continued the tour ONLY in German. That made it pretty useless for me . The circuit is extremely long and we had planned on using it to first get a glimpse of things and then start getting off. The circuit was so long that we did some walking and then took the metro. I feel like a paid a lot of money for not much. I'm sorry to say that if you don't understand German, forget this trip particularly the harbour cruise. We sat there like idiot on the harbour cruise while all enjoyed laughter and jokes and not a word of English was spoken. As for the bus tour, I understand and speak a good deal of German although my wife speaks none and i explained to her that what they were explaining in English was about one tenth of what they were saying in German. It would seem that these tours are directed at German tourists and not International. Hamburg is a beautiful city to see but as for the method of our sightseeing I wouldn't waste my money again!!! Eigentlich waren die beiden Tours sehr enttaeuschend. Ich selber kann Deutsch verstehen, aber meine Schueler verstehen die Sprache noch nicht fliesend. Ich habe zwar Tours auf Englisch gebucht, aber die Fuehrer haben nur auf Deutsch gesprochen. Ich musste alles uebersetzen und sie haben viel verpasst. Es gibt sehr viele Chinesen in Deutschland und sie wollen auch die Tours in Englisch haben. Sorry, es ist leider so.